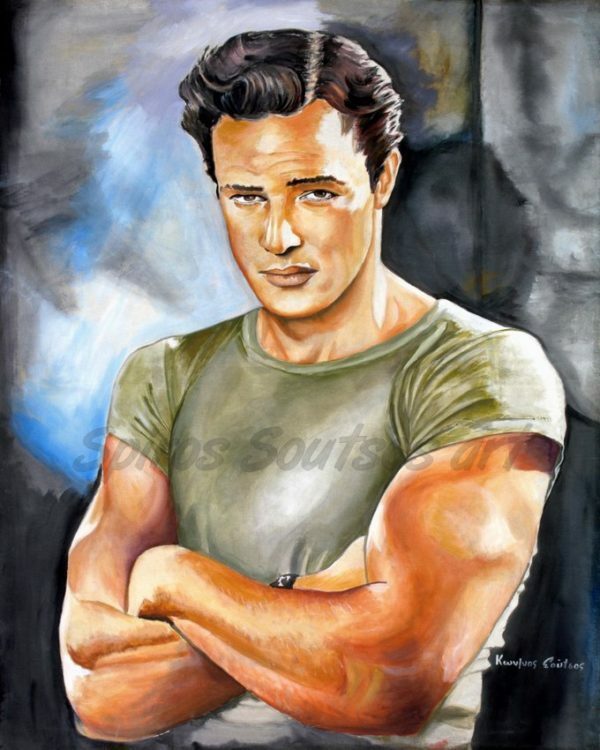 Marlon Brando (April 3, 1924 – July 1, 2004) was an American actor, film director, and activist. He is hailed for bringing a gripping realism to film acting and is often cited as one of the greatest and most influential actors of all time. He is also credited with helping to popularize the Stanislavski system of acting, today more commonly referred to as method acting. A cultural icon, Brando was also an activist for many causes, notably the African-American Civil Rights Movement and various American Indian movements. He initially gained an Academy Award nomination for playing the role of Stanley Kowalski in the Elia Kazan’s 1951 film adaptation of Tennessee Williams‘ play A Streetcar Named Desire, a role that he had originated successfully on Broadway. He won his first Academy Award for his performance as Terry Malloy in Elia Kazan’s On the Waterfront (1954), and in his portrayal of the rebel motorcycle gang leader Johnny Strabler in The Wild One (1953) proved to be a lasting image in popular culture. Brando received Academy Award nominations for playing Emiliano Zapata in Elia Kazan’s Viva Zapata! (1952), Mark Antony in Joseph L. Mankiewicz’s 1953 film adaptation of Shakespeare’s Julius Caesar; and Air Force Major Lloyd Gruver in Sayonara (1957). The 1960s proved to be a fallow decade for Brando. He directed and starred in the cult western film One-Eyed Jacks, a critical and commercial flop, after which he delivered a series of box-office failures, beginning with the Joseph L. Mankiewicz’s 1962 film adaptation of the novel Mutiny on the Bounty. In 1972, he won his second Academy Award for playing the greatest role in his career, that of Vito Corleone in Francis Ford Coppola’s The Godfather. The Godfather was then one of the most commercially successful films of all time. With that and his Oscar-nominated performance in Bernardo Bertolucci’s Last Tango in Paris (1972), Brando re-established himself in the ranks of top box-office stars, placing sixth and tenth in the Money Making Stars poll in 1972 and 1973, respectively. Brando took a four-year hiatus before appearing in The Missouri Breaks (1976). After this, he was content with being a highly paid character actor in glorified cameo roles, such as in Superman (1978) and The Formula (1980), before taking a nine-year break from motion pictures. According to the Guinness Book of World Records, Brando was paid a record $3.7 million ($14 million in inflation-adjusted dollars) and 11.75% of the gross profits for 13 days’ work on Superman. He finished out the 1970s with his controversial performance as Colonel Kurtz in another Coppola film, Apocalypse Now (1979), an anti-war film and a box-office hit.